In the summer of 1917, Cliff Brown was a resident of Ray City, Berrien County, GA when he registered for the draft for World War I. Cliff Brown was African-American and, at age 22, he was of medium height and build, with black hair and black eyes. He was a native of Hawkinsville, GA born May 15, 1895. 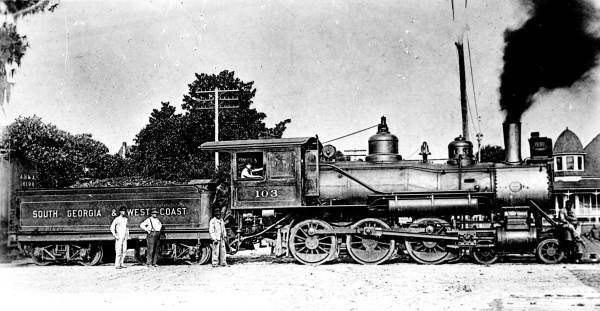 The South Georgia & West Coast Railroad was built by brothers Zenas and James Oglesby of Quitman Georgia, and ran from Adel to Hampton Springs, FL. In Adel, the line connected with the Georgia & Florida Railroad which served Ray City, GA, running from Jacksonville, GA to Madison, FL. Hampton Springs, FL, the southern terminus of the South Georgia & West Coast Railroad, was the site of the famous Hampton Springs Hotel, once labeled “Dixie’s Famous Spa.” While the hotel was very popular with the railroad’s white passengers in the early 1900s, African-Americans like railroad worker Cliff Brown were no doubt denied access to the resort.